Quiet for Kids – The Bookshelf of Emily J. Several years ago, I posted about Susan Cain’s book Quiet: The Power of Introverts in a Word that Can’t Stop Talking. I loved the book. I loved its message. 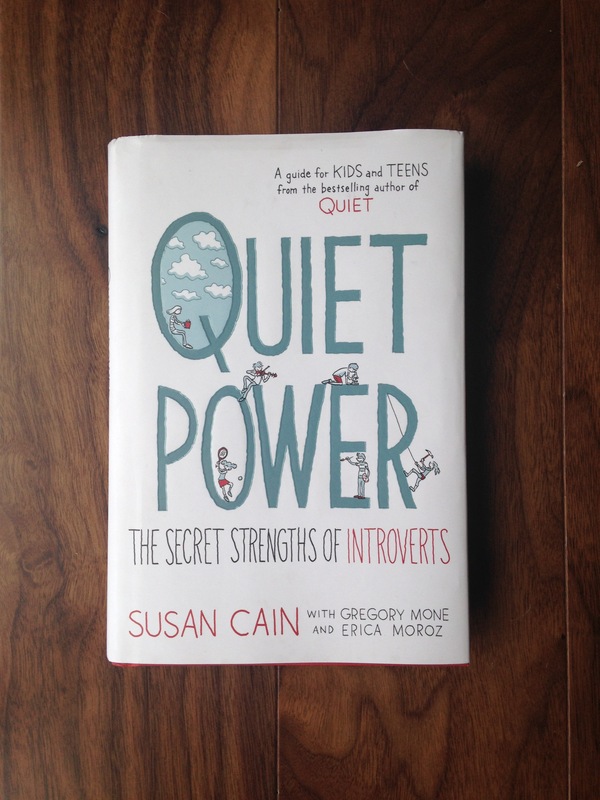 Today I’m posting about my daughter’s reaction to reading Cain’s adaptation of that book for kids, called Quiet Power: The Secret Strengths of Introverts (2016). Here is what Olivia said about the book. “It was just kids’ stories, like their experiences with being introverted. Their experiences with a ton of extroverts and exploring how in these situations if introverts are actually better or if introverts were always better. “Her [Cain’s] experiences was she went to summer camp and thought it would be the best thing ever. She thought wrong. So she brought a ton of books and read. One girl asked her why she read all the time and she decided to go outside and try to participate. “Introverts are better leaders because they listen more than extroverts, because if all the extroverted kids go in one group they are more talkative and if introverts go into one group then they will listen better because they are more quiet, shy. “They did this with a shirt folding thing. He gave them two ways to fold shirts and the introverts were better because they listened better and observed better. “Just a bunch of kids experiences. “It was really good. It helped me to think about the advantages of introverts. I applied it to myself in class because I have to raise my hand if I have a question even if it is scary. I raise my hand more. I still need to read this version of the book. But based on what my daughter said, it sounds pretty good and appropriate for kids around the age of 10 and up. I got it for her to read because I know she is quiet and shy in class, so I’m hoping that the book gave her some self confidence and encouraged her to use her quiet strengths and to view those traits positively. Me too! Her work is compelling. Emily, I cannot think of a better book for today. To reinforce the point about leadership, there is a trend for CEOs of complex companies to be more introverted. We have tended to mistake extroversion and false bravado with leadership. Just because someone can boast about themselves, does not make them a great leader. Two quotes from business that resonate with me. 1) The better leaders deflect credit to others, while the worse ones assume more credit than they deserve. 2) You have two ears and one mouth. They should be used in that proportion. Yes! So true. I often wonder if some of the obstacles I’ve faced in presenting myself publicly for jobs in academia has to do with my introversion. It is a great quality for leadership, for research, for teaching, for writing, but it isn’t that great for public speaking. I think I’m pretty good at faking that public part, but I do get nervous and I’m not quick on my feet with questions. I am a thinker! Thanks for the comment. Emily, I think most people detest public speaking, even extroverts. So, I would suggest folks use that to their advantage and make a remark that gets the audience on your side. When I have spoken to a large group, it is sometimes good to work the crowd before hand during a break. Or, if I had a young team member who had a speaking role later in a meeting, I would encourage them to comment on something else earlier rather than fret over talking later. Sorry for the digression. In the Myers Briggs analyses, I am equal parts extroverted and introverted, depending on the circumstances. And, by the way. I remember you doing well when you were asked to speak by Katie Couric on your work a few years ago. Keith, thanks! I am probably just too hard on myself. I like hearing from you and your expertise, so please distress all you want. Thanks for the post. Definitely want to check this out for my little introverts . . . and me, too! Enjoy! I think it was a brilliant idea for Cain to release this for kids. I applaud you for encouraging your daughter–it’s quiet applause, a hushed shout. I totally relate to making introverted kids participate in class. I had lots of easy ways warm up so as not to embarrass the kids, but I still had to make them participate. I completely agree: Introverted kids knew how to listen and followed instructions ten times better than extroverted kids. And, I may add, their personalities seemed more genuinely developing, not needing to bounce around so much to find out who they were becoming. Encourage your daughter that her teenage years will not be so turbulent! Will do, Dave! Thanks for your encouragement. It sounds like you have a lot of experience with this yourself and with teaching. I wish more of us knew that being introverted is “normal” from a young age so we don’t end up feeling so out of place. Hopefully, her teenage years will be calm! Oh, I would love to read this! Even more than I would like to read the original. We are a family of introverts (some of us more so than others), and I would love for them to feel more confident about it. Kids are often pushed to participate more in school, but I don’t think it’s always a good thing. A little, but not too much. Glad you read my daughter’s review. 🙂 I bet this would be a good book to read as a family. Three of us are introverts in our family, and my youngest is outgoing and unafraid of people. We need her! Cute review. I would imagine it’s some of the same material as the original book, just aimed at kids with different examples. Yes, I think so. I need to take a closer look to be sure. Thanks again Emily. Susan Cain’s book “Quiet” is on my pile of ‘to read’ books. Sounds like I need to move it closer to the top of the pile. Finished an audio version of “Quiet” today. My goodreads spiel is here https://www.goodreads.com/review/show/1675815680 . As for my personal response to it… well.. let’s just say I recognise the tune to the song Susan Cain is singing softly through her words. I’m so glad you had a chance to listen to it. I love how you put it: I think all of us introverts can easily recognize what she is saying. It is painfully familiar, but I like that she put a positive spin on it. I think she’s right! Sounds like a great book! I sure could’ve used something like that as a kid. I like the title of that one. It sounds like I need to read it! It sounds like the sort of book I could’ve really used as a kid! Been meaning to read ‘Quiet’ for ages but may also have to get this for my baby brother! It would make a great gift! I hope you get a chance to read Quiet. It is a good one. It’s going on my Goodreads to-read list as we speak!